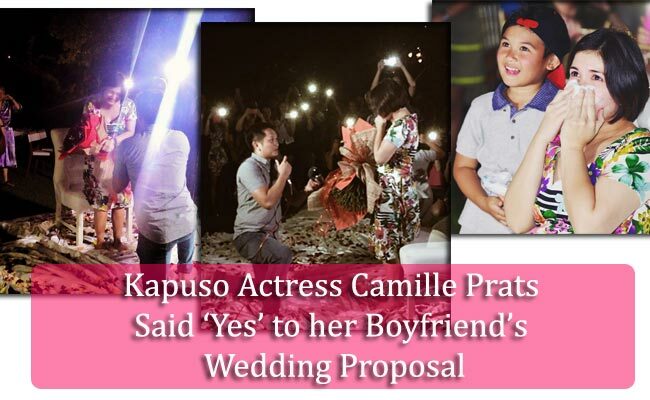 Kapuso actress Camille Prats said ‘yes’ to her boyfriend’s wedding proposal last July 18, 2015. Nice Print photography was able to share their priceless moment on Instagram and broke the news in social media. On her official Facebook account, Camille Prats shared that she would say ‘yes’ a thousand times over to her fiance, John Yambao. She also posted a photo of the moment being with her son during that special night, sharing that she was not the only one engaged but also her son. She called her fiance a blessing to both of them. Camille also thanked her brother and his wife, Isabelle Oli, for taking part in the grand surprise. She also expressed her gratitude to all her family and friends to whom they had shared the special moments. Camille is currently co-hosting Kapuso’s Mars, an afternoon magazine TV show especially for moms, and starred in Munting Heredera. She was married to Anthony Linsangan in 2008. In 2011, Linsangan died of cancer. Camille and Anthony have a son named Nathaniel Caesar, now 7. Camille started dating Yambao in 2013 and she have posted their photos of various activities together with Nathaniel. The actress also thanked Nice Print photography for being part of her family’s special moments including her brother’s wedding and engagement.